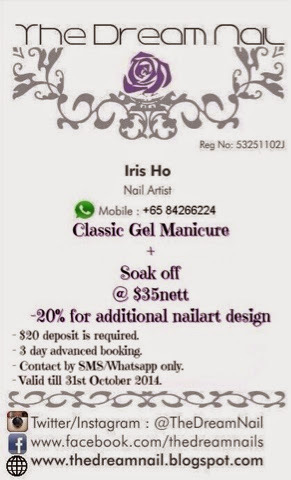 TITLE; October nail promotion is here!! Dear lovely ladies, good morning to you. Hope you have a great weekend ahead. Our october promotion is up for booking of appointments. Dont miss these deals! New promotion is up! Please take a look. There will be someone doing for you thou owner is on leave. So dont worry about missing our great deals! Appointment booking is now open again. For pampering your nails with our great deals, please kindly contact us by SMS/Whatsapp only. For appointment bookings, please SMS/Whatsapp us only @ +6584266224.